For many years now, since the first batch of single gene mutations that enhance longevity in short-lived laboratory species were discovered, the cellular maintenance processes of autophagy have occupied a central role in considerations of aging. The open access paper I'll link to today is focused on autophagy in the heart, and provides a good example of the reasons why autophagy is of interest to many of the researchers who search for ways to slow the progression of aging. Aging is at root a process of damage accumulation. We are machines and we wear and break. Unlike the much simpler mechanical and electrical devices that surround us these days, however, our machinery has a great capacity for self-repair. The overwhelming majority of molecular damage and disarray that arises constantly in all of our cells is repaired very quickly. This makes the progression of damage over time a much more complicated and layered process than is the case in a car or a computer. You can look at the Fight Aging! FAQ for a high level summary, but that does no justice to the poorly understood intricacy of the ways in which the many forms of damage interact over time, and the way in which the diminished capacities or dysfunctions of specific organs and systems in the body feed into one another. Aging is perhaps as much a failure of repair systems as it is an accumulation of damage that cannot be repaired at all - though that certainly does exist in the form of cross-links that cannot be broken down, even in youth, to pick one example. Autophagy is an important set of cellular repair systems, responsible for breaking down and recycling damaged structures, as well as some large molecules and metabolic wastes. It is a complicated arrangement of signals, detection of damage, markers for damage, processes for moving things around the cell, and specialized organelles that actually perform the dismantling. More autophagy is better for the obvious reason that it means there is less damage at any given point in time, so less of a chance for that damage to cause further issues. Many of the methods of extending life in laboratory species are associated with a higher level of autophagy in at least some tissue types. Calorie restriction, for example, the most well studied of all of the methods of somewhat slowing aging, appears to depend on autophagy for most of its benefits. Disable autophagy, and life is no longer extended by a diet lower in calories. One thing that has become very apparent from the past two decades of making various animals live modestly longer lives is that evolution has not selected for the optimal level of autophagy - or at least, longevity doesn't seem to be high on the list of factors determining that optimal level. Because the incidence of cardiac disease increases dramatically with age, it is important to understand the molecular mechanisms through which the heart becomes either more or less susceptible to stress. Cardiac aging is characterized by the presence of hypertrophy, fibrosis, and accumulation of misfolded proteins and dysfunctional mitochondria. Macroautophagy (hereafter referred to as autophagy) is a lysosome-dependent bulk degradation mechanism that is essential for intracellular protein and organelle quality control. Autophagy and autophagic flux are generally decreased in aging hearts, and murine autophagy loss-of-function models develop exacerbated cardiac dysfunction that is accompanied by the accumulation of misfolded proteins and dysfunctional organelles. On the contrary, stimulation of autophagy generally improves cardiac function in mouse models of protein aggregation by removing accumulated misfolded proteins, dysfunctional mitochondria, and damaged DNA, thereby improving the overall cellular environment and alleviating aging-associated pathology in the heart. Because autophagy is downregulated with age and downregulation of autophagy promotes senescence of the heart, interventions to increase the level of autophagy may prevent or slow the progression of aging in the heart. Furthermore, considering the fact that cardiac aging is accompanied by the accumulation of insoluble polymeric materials, such as lipofuscin, and damaged organelles, it would seem to be advantageous to have a degradation mechanism with a large capacity. Interestingly, both calorie restriction (CR) and suppression of mTOR, interventions that alleviate the adverse effects of aging and increase lifespan, promote autophagy in many cell types and organs, even when autophagy is suppressed by aging. Importantly, CR has been shown to reduce age-related pathologies and diseases in animals. However, whether the beneficial effects of these interventions are mediated primarily through activation of autophagy in the heart requires further study. Fourth, it is important to clarify the molecular mechanisms by which autophagy or mitophagy regulates cardiac aging. Although autophagy is generally thought to be a nonspecific mechanism of protein degradation, there is increasing evidence that some proteins may be specifically degraded. Fifth, most of the investigations reported to date focused only on autophagy in cardiomyocytes during aging. It is important to determine whether autophagy in other cell types, such as inflammatory cells, also affects cardiac aging and, if so, how these cells communicate with cardiomyocytes. Finally, it is essential to develop more convenient and specific interventions to normalize the level of autophagy in the heart during aging. Autophagy mediates many lifespan-extending and antisenescence mechanisms. Together with the recent advancement in understanding the molecular mechanisms of autophagy, investigating the role of autophagy/mitophagy during cardiac aging should eventually lead to the development of more efficient and specific interventions to slow senescence and increase stress resistance in the heart. The paper I'll share today takes a look at stem cells over the course of aging in different sea urchin species that exhibit radically different life spans, ranging from a few years to somewhere north of a century. A fair number of marine species, some urchins included, are negligibly senescent, meaning that they show few signs of degeneration or increased mortality due to intrinsic causes until very close to natural death. In some cases it has been impossible to measure life span in a random sample gathered from the ocean, as was true for lobsters until recently, and that combined with the paucity of funding for investigating the aging of sea life has meant that the research community has no good, certain data for the maximum life span of many of these species. When looking at lower life forms that appear to be ageless or very close to ageless, such as hydra, a common theme is hyperactive, proficient, constant regeneration of all tissues. Since distinct populations of stem cells serve this purpose in hydra and higher species, both those that are negligibly senescent and those that age gracelessly, it makes sense to gain a better understanding of how stem cell biology differs between those who age and those who age less. This isn't just longer lives versus shorter lives, but perhaps more importantly how much of an age-related decline occurs across the life span. There are also other compelling reasons for such an investigation, such as the differences between salamanders, capable of regrowing limbs and organs, and mammals, who cannot. That may be somewhat orthogonal to the question of how stem cell biology affects aging, since it is debatable as whether or not salamanders are negligibly senescent. This isn't a classification with a clear dividing line, and many species are happy to occupy the large grey area. Still, that is a problem solved by gathering more data, and by gaining more knowledge - and thus at root by funding more research. In our species, and most others of interest, stem cell activity declines with age. The conventional wisdom, not unchallenged, is that this serves to give us additional time free from cancer at the expense of a loss of tissue maintenance, producing growing frailty and increasing organ failure. Damaged cells undertaking activity raise the risk of cancer. If those cells instead remain quiescent, there is less of a risk. In the view of aging as an accumulation of cell and tissue damage, stem cells shut down in response to rising levels of damage. But how does this all work in negligibly senescent species, and - as ever - how might the research community port over some of those benefits into our biochemistry in a cost-effective manner? For my money, I'd guess that this line of development is destined to be lengthy and expensive, but that is the way of most research. The better path as I see it is to repair the damage that causes stem cells to react by retreating from their work, and to replace those stem cell populations wholesale where the cells have themselves become damaged. The present stem cell industry is a good first step on that road, but there is much more yet to be done to reach the desired endpoint. Sea urchins are remarkable organisms. They can quickly regrow damaged spines and feet. Some species also live to extraordinary old ages and - even more remarkably - do so with no signs of poor health, such as a decline in regenerative capacity or an increase in age-related mortality. Researchers study the regenerative capacity of sea urchins in hopes that a deeper understanding of the process of regeneration, which governs the regeneration of aging tissues as well as lost or damaged body parts, will lead to a deeper understanding of the aging process in humans, with whom sea urchins share a close genetic relationship. Researchers studied regenerative capacity in three species of sea urchins with long, intermediate and short life expectancies: the red sea urchin, Mesocentrotus franciscanus, one of the world's longest-lived organisms with a life expectancy of more than 100 years; the purple sea urchin, Strongylocentrotus purpuratus, with a life expectancy of more than 50 years; and the variegated sea urchin, Lytechinus variegatus, with a life expectancy of only four years. The scientists hypothesized that the regenerative capacity of the species with shorter life expectancies would decline as they aged. Much to their surprise, however, they found that regenerative capacity was not affected by age: as with the very long-lived sea urchin, the regenerative capacity of the species with a shorter life expectancy did not decline with age. "We wanted to find out why the species with short and intermediate life expectancies aged and the long-lived species didn't. But what we found is that aging is not inevitable: sea urchins don't appear to age, even when they are short-lived. Because these findings were unexpected in light of the prevailing theories about the evolution of aging, we may have to rethink theories on why aging occurs." Sea urchins exhibit continued growth and reproduction throughout their lives and yet different species are reported to have vastly different life expectancies in the wild. The proper balance of cell division and cell death is important for life-long growth and homeostasis and maintaining this balance with age would be essential to achieve negligible senescence, whereas failure to maintain this balance would promote aging and shortened lifespan. In this study, cell proliferation was measured using in vivo incorporation of 5-bromo-2′-deoxyuridine (BrdU). It was determined that there was a low level of BrdU incorporation and apoptosis in the internal tissues of three species of sea urchins with different lifespans, regardless of age. The low levels of cell proliferation are consistent with the low metabolic rates that have been reported for sea urchins, and suggest that unlike Hydra, sea urchins do not avoid senescence by continually replenishing tissues at a high rate. As expected for animals that grow indeterminately, there were higher levels of cell proliferation compared to apoptosis in the tissues. The low levels of apoptosis in the tissues of young and old animals are consistent with low levels of cellular damage that does not increase with age. Interestingly, in L. variegatus and S. purpuratus, which have a ~ 10-fold difference in lifespan, there were few differences in the amount of cell proliferation and apoptosis in tissues compared within age categories. To determine whether regenerative potential was maintained with age in sea urchins, the regrowth of amputated spines and tube feet was measured in L. variegatus and S. purpuratus. The data demonstrate that the regenerative potential of both types of appendages was maintained with age in these sea urchin species. A prediction from the evolutionary theories of aging is that level of extrinsic mortality influences the rate of aging, such that high levels of extrinsic mortality would be associated with tissue decline once an organism reaches reproductive maturity and survivorship in the wild becomes increasingly unlikely. L. variegatus is predicted to have a much lower annual survival rate than S. purpuratus and M. franciscanus and an estimated lifespan in the wild of about 4 years, and yet the results did not show evidence of decline in regenerative capacity in larger/older animals. It is possible that L. variegatus have the potential to live much longer than has been reported in the wild (and hence that the animals used in this study were not approaching their maximum lifespan potential), or that longevity in these animals is not limited by investment in (or capacity for) maintenance and repair of damaged tissues. The lack of age-related differences in the maintenance of tissue homeostasis and regenerative potential in sea urchin species with different lifespans were unexpected in light of current evolutionary theories of aging, and further study is required to understand the factors underlying the short lifespan of L. variegatus in particular. It is an unfortunate fact of life that many promising avenues of medical research languish partially developed and unfunded. It isn't unusual to see potentially transformative medical technologies linger with little further progress for a decade or more after their first triumphant discovery. The innovative antiviral DRACO technology is one such, offering the potential of therapies for persistent infections that cannot currently be treated. Another is the use of immune cell transplants to attack cancer, presented in its initial form of granulocyte infusion therapy (GIFT) with accompanying compelling animal data at the third SENS conference in 2007, but under development for years prior to that point. Where is this approach to cancer treatment today, nearly a decade down the line? Little advanced beyond that point, I'm sorry to say. In fact so little progress has occurred and so little attention has been given to this style of cancer treatment that other researchers are now and then independently finding their way to the same place from different directions, as noted in the paper and publicity materials that are linked below. Why does this waste of potential continue to happen over and again in the field of medical research and development? One challenge is that a life in the fairly rigid hierarchy of the sciences is typically poor preparation for the cut and thrust of bringing a new technology into the marketplace, raising funding outside the established channels of grants, and working with businesses. That is an entirely different set of skills and talents. Some scientists have those skills and talents, and you'll tend to see those people starting companies or leading laboratories. Most do not - just as there are few entrepreneurs and leaders in the general population, there are also few entrepreneurs and leaders within the scientific community. There are only so many hours in the day, time spent on one set of skills is not spent on another, and science is a demanding partner. Just because a team makes a solid advance in their field doesn't mean they are well positioned or qualified to make it a success after that point. Another issue, important in this case, is that the combination of heavy regulation of medicine, regulatory capture, and the consequent dominance of very conservative large developers and very expensive development processes means that medicine rarely moves forward for any potential treatment in which the biochemical mechanisms cannot be explained. Ten years ago, there was no good explanation for why GIFT was so good at defeating cancer in mice. Progress within the system and the present cultural edifice of cancer research required that explanation - the idea of moving ahead based purely on great results doesn't win you support from Big Pharma, and without that support there are few organizations with deep enough pockets to move ahead through the burdensome FDA processes as they stand these days. So while there have been trials of immune infusion therapies for cancer, these were small and funded from other sources. That backing is not extensive. There have been some signs of availability in the medical tourism space, but without more of a mainstream interest in the field that is also so far anemic. An entirely different class of problem contributing to the existence of moribund fields of research is the lack of funding and attention given to medical research in general. Very little of medical research is funded to anywhere near a reasonable level given the potential expectations for resulting benefits. To a first approximation, no-one cares about medical research and medical progress, or at least not until it is far too late to do anything about it. Research survives on the scraps and margins of philanthropy of this wealthy society. Bread and circuses before progress, and near all of the money in medicine goes towards using the technology that exists, even when there are much better alternatives within reach, just a few years of development away. Researchers decided to test whether a "borrowed immune system" could "see" the cancer cells of the patient as aberrant. The recognition of aberrant cells is carried out by immune cells called T cells. All T cells in our body scan the surface of other cells, including cancer cells, to check whether they display any protein fragments on their surface that should not be there. Upon recognition of such foreign protein fragments, T cells kill the aberrant cells. As cancer cells harbor faulty proteins, they can also display foreign protein fragments - also known as neo-antigens - on their surface, much in the way virus-infected cells express fragments of viral proteins. To address whether the T cells of a patient react to all the foreign protein fragments on cancer cells, the research teams first mapped all possible neo-antigens on the surface of melanoma cells from three different patients. In all 3 patients, the cancer cells seemed to display a large number of different neo-antigens. But when the researchers tried to match these to the T cells derived from within the patient's tumors, most of these aberrant protein fragments on the tumor cells went unnoticed. Next, they tested whether the same neo-antigens could be seen by T-cells derived from healthy volunteers. Strikingly, these donor-derived T cells could detect a significant number of neo-antigens that had not been seen by the patients' T cells. "In a way, our findings show that the immune response in cancer patients can be strengthened; there is more on the cancer cells that makes them foreign that we can exploit. One way we consider doing this is finding the right donor T cells to match these neo-antigens. The receptor that is used by these donor T-cells can then be used to genetically modify the patient's own T cells so these will be able to detect the cancer cells. Our study shows that the principle of outsourcing cancer immunity to a donor is sound. However, more work needs to be done before patients can benefit from this discovery. Thus, we need to find ways to enhance the throughput." Accumulating evidence suggests that clinically efficacious cancer immunotherapies are driven by T cell reactivity against DNA mutation-derived neoantigens. However, among the large number of predicted neoantigens, only a minority is recognized by autologous patient T cells, and strategies to broaden neoantigen specific T cell responses are therefore attractive. Here, we demonstrate that naïve T cell repertoires of healthy blood donors provide a source of neoantigen-specific T cells, responding to 11/57 predicted HLA-A2-binding epitopes from three patients. Many of the T cell reactivities involved epitopes that in vivo were neglected by patient autologous tumor-infiltrating lymphocytes. Finally, T cells re-directed with T cell receptors identified from donor-derived T cells efficiently recognized patient-derived melanoma cells harboring the relevant mutations, providing a rationale for the use of such "outsourced" immune responses in cancer immunotherapy. Disruption is a part of progress. All communities of research and development go through cycles in which (a) the established mainstream and its insiders become slow and ineffective, (b) outsiders become frustrated given the unrealized potential for faster progress and better outcomes, (c) some of these outsiders succeed in developing a vastly better path forward, despite being opposed at every turn by the mainstream, (d) the new path forward displaces the existing mainstream, and the outsiders become the new leaders and insiders, (e) with time, this new mainstream becomes slow and ineffective. So the cycle repeats. In the matter of medicine, aging, and longevity, we are presently somewhere in the midst of step (c). The mainstream of ineffective, expensive approaches to the treatment of age-related conditions is ineffective and expensive because it fails to consider or address the root causes of aging. Try making any damaged machine work better and longer while not actually repairing the damage - it isn't easy. The typical approach to research is to start with the end stage disease state and work slowly and painfully backwards through a very complex dysfunctional metabolism. At the first proximate cause, stop and try to build a treatment that can manipulate the diseased metabolic state so as to make the proximate cause less onerous to the patient. Then return to tracing the disease backwards towards root causes. There are so many layers of proximate causes in most diseases that this type of approach can continue - and has continued - for decades without ever getting close to the cell and tissue damage that is the root cause of aging, and thus the root cause of all age-related disease. This, however, is the mainstream, the default approach. It is an established culture, reinforced by regulation and tradition, and will change but little without disruption. The most important outsiders attempting to disrupt aging research in favor of effective progress towards treatment of aging are those of the small community that built and supported the Methuselah Foundation and SENS Research Foundation, pulling in philanthropic funding and gathering allies in support of a repair-based approach to the treatment of aging. The fundamental, root causes of aging are well cataloged, forms of cell and tissue damage caused by the normal operation of metabolism, so why wade through the mud of how exactly aging progresses in detail from these causes, and why start at the end and work backwards? Just fix the known causes using any of the envisaged and planned potential classes of repair therapy and see what happens. The potential for cures first, full understanding later: too many people are dying to indulge the mainstream's preferred approach. We are far enough into this process of disruption that some outsiders have become scientists and some scientists have joined the insurrection. There are thousands of supporters of rejuvenation research, there is respectful and informed press attention, and tens of millions in funding have been deployed to advancing this cause. The first rejuvenation therapies are under development in startup companies. We're almost at the stage where the people who at the beginning carried out the hard, thankless work of spreading new ideas, obtaining support, and kicking shins - telling the scientific community that they were going about everything the wrong way - start to be buried by the second wave. It is the fate of all pioneers to be forgotten and trodden upon by a collaboration between later newcomers, those with more resources to claim the mantle of leadership, and those of the former mainstream who decide to pretend that they agreed all along. Such is life. It is frustrating, but the important thing is not the credit, but that the job will be done, that repair-based therapies for aging will become the new mainstream on the basis of obtaining far better results than the present approaches to aging. Life and health before pride. The article linked below struck me as exhibiting a nice mix of many of the agendas that come to the fore during the disruption of an industry, ranging from the several factions intent on burying the original disruptors to individuals with the mainstream attempting to present a slight adjustment of their methods as an alternative to the still vastly better disruptive technology. I'm not sure I agree with all of the core thesis. Some of those presented as outsiders, such as Larry Ellison and Paul Glenn, were almost immediately co-opted by the mainstream of the time. There isn't enough of a distinction made between for-profit and philanthropic funding, as the latter has been vastly more influential and important over the years in which I've been observing progress in aging research. But see what you think. I've been led here by Sonia Arrison, a Silicon Valley local and author of 100-Plus: How the Coming Age of Longevity Will Change Everything. Arrison has agreed to show me around her strange Californian world, populated with very wealthy, very smart dreamers, who share her certainty that a longevity revolution is on its way. We've arrived on Joon Yun's doorstep to learn how and why he, along with a small group of big power players, plan to "cure" aging and extend human health span - and possibly even human life - by decades, if not centuries. "I essentially made a wager to myself that aging is a code," Yun explains to me from across a shiny conference table. "If aging is a code, that code could be cracked and hacked. The current system in healthcare is a whack-a-mole of your symptoms until you die. It addresses the diseases of aging, but not curing the underlying process behind aging itself. The healthcare system is doing a good job of helping people live longer and stronger lives, but aging is still a terminal condition." In 2014, Yun created the Race Against Time Foundation and Palo Alto Prize, which will award 1 million to a team that can demonstrate the capacity to mitigate aging by, among other things, extending the life of a mammal by 50 percent. Faith that science will conquer aging is common in Silicon Valley these days. The language Yun uses to explain his dream - especially the use of the word "cure" - makes traditional researchers in the field of aging cringe. But few are complaining about the interest of the big-spending Silicon Valley crowd. In recent years, public institutions like the National Institutes of Health have been slow to commit any more than a token of their overall budgets to aging research. It is the private funders with big dreams who are galvanizing the field. The Ellison Medical Foundation has spent nearly 400 million on longevity research. Oracle founder Ellison told his biographer, "Death makes me very angry." PayPal cofounder and venture capitalist Peter Thiel helped fund the SENS Research Foundation, a longevity organization co-led by British gerontologist Aubrey de Grey, who's argued we might someday halt aging and extend life indefinitely. (Arrison, Thiel's longtime friend, introduced the two). In 2013, the founders of Google launched Calico, short for California Life Company, to research aging and associated diseases. A year later Calico teamed up with the biopharmaceutical company AbbVie, with which it plans to invest up to 1.5 billion to develop age-related therapies. "With some longer term, moonshot thinking around healthcare and biotechnology, I believe we can improve millions of lives," wrote Google cofounder Larry Page. The quest to extend longevity makes perfect sense in Silicon Valley, explains Lindy Fishburne, a longtime lieutenant of Thiel's, in her stately office in San Francisco's Presidio, a former military base that sits on a pictorial tip of the San Francisco Bay. "It's the engineering culture which says we'll build our way out of it, we'll code our way out of it, there has to be a solution. I also think it's coupled with a very unique optimism that is pervasive in Silicon Valley." It is worth noting that all too few of the people and funding sources mentioned in the article are in fact backing the repair-based approaches to rejuvenation that are, to my eyes, the most likely to realize a future of greatly extended healthy lives, and to accomplish these gains soon enough to matter to you and I. Many of those involved are either already or on their way to being captured by the present ineffective mainstream, just like Ellison and Glenn. Nonetheless, disruption is underway, and threads of meaningful work will continue to grow. It is still early enough in this process that ordinary folk like you and I can make a mark: our philanthropy and support for the SENS Research Foundation and similar organizations in past years has produced meaningful change in the status quo, and that change is spreading. What's the goal of the GRG? Do you want to live forever? So basically at the moment it has two main departments. One is run by the successor of Dr. Stephen Coles, who founded the GRG in 1990 and passed away in 2014 at the age of - unfortunately - only 73. The goal was for other scientists to get together and discuss the aging process and discuss potential treatments for the aging process. The idea at the time was that Western medicine was too focused on treating the symptoms of aging and not focused on treating the causes of aging. The idea was that if you put a bunch of bright minds together, you would get good results. What's the history of age validation? It started in the 1800s with life insurance policies. Actuaries were trying to figure out how long people lived to calculate rate for those policies. Except for the small niche field of actuarial research, very little research was done into supercentenarians. There was no database when the GRG decided to start keeping track in 1998. About 1 in 5 million people in the US are 110 and older, and before the internet came along there was no way to assemble someone that rare into data groups. But when the internet came along, we could get information from all over the world, and it became viable to study them as a population group. Things have changed so fast since the GRG went online in 1995, almost 21 years ago. Smart phones came around 2007, 2008. Go back to 2004 and ancestry.com only had 20 percent of the US census data online. Go back to 2000 and if you wanted to find a document on an extremely old person, you had to use the old hand-crank newsreel. Wow. It could take hours upon hours to look on every line of every page. I feel like there's a story every month about the world's oldest person dying. So here's the thing. There's a misconception that the world's oldest person dies all the time. Not true. Since Guinness started keeping track in 1955, the average length of reign has been about 1.6 years. Part of the problem though is that we do have unverified claims of people saying they're older than the oldest person and that gets reported by the media. You also get what's called the longevity myth, which is where people's imaginations exceed reality. So if you don't have a record of when you're born and you're gonna guesstimate your age, and after the age of 80, people begin to inflate their age. Give it to me straight. What is the longest I could possibly live? Scientifically speaking, the odds of living to 127 at the moment are one in a trillion, which means it's not happening. Living to anywhere between 115 and 120, you have what I call "probable impossible," I'd say there's about a 1 percent chance, but there's still a possibility. Between 120 and 127, the odds of surviving really begin to disappear totally. When we look at the statistics, we have currently 2,500 cases of people 110 plus. Of those, by the age of 118, only two. When you're going from 2,500 to two in just eight years, to me that's scary. Humans seem to have a warranty period of about 100 years. The average cell divides every two years. Cells divide about 50 times. To get to 115, you'd have to age about 15 percent slower than normal. Basically, Jeanne Calment, who lived to be 122, was called the Michael Jordan of aging. The point was that all the practice in the world isn't gonna make you play basketball like Michael Jordan. OK? On the other hand, if Michael Jordan never practiced, he wouldn't be as good as he was. So you have to fulfill your potential by trying to do the best you can do, but at the same time, you can't make yourself a longevity star. Do you get the sense that it's even worth living that long? Is there any quality of life at 115? I've probably met over 50 who are 110 plus. It can vary. One of the things that's clear to me is that you can't put them all in one category. We had one woman who was 116 who lived in her own home, she could walk with a walker, she ate Wendy's, she watched TV, she could do an interview. That's the ultimate extreme case of living well and hanging out with the great, great grandkids. On the other hand, we had a woman who was confined to bed for 21 hours a day, awake for only three, unable to get up. That's a sad situation where maybe it's not worth it. Most people are somewhere in the middle. One more thing I wanna say is that the people who live the oldest are in the best shape. So almost everybody that lives to be 115 was living on their own at 100. So we need to get rid of this idea of, "I'm gonna be 30 years in a nursing home." It's not like that. "Most genetic research today is focused on inherited gene variants - mutations that are inherited by the offspring, but what we're looking at are postzygotic mutations that are acquired during life. Using new tools to analyze genetic variations that accumulate with age, we can help explain how sporadic diseases like cancer or Alzheimer's manifest." One such postzygotic mutation found in the cells of biological males is the loss of the Y chromosome in a degree of blood cells. Loss of Y occurs in up to 17 percent of men and is more likely to be found in older men and men who smoke. This study expands on the idea that loss of Y, already a known risk factor for cancer, could be a predictive biomarker for a wider range of poor health outcomes, specifically Alzheimer's. Why loss of Y can be linked to an increased risk for disease remains unclear, but the authors speculate it has to do with reduced immune system performance. The researchers looked at over 3,000 men to ascertain whether there was any predictive association between loss of Y in blood cells and Alzheimer's disease. The participants came from three long-term studies that could provide regular blood samples: the European Alzheimer's Disease Initiative, the Uppsala Longitudinal Study of Adult Men, and the Prospective Investigation of the Vasculature in Uppsala Seniors. Across the datasets, those with the highest fraction of blood cells without a Y chromosome were consistently more likely to be diagnosed with Alzheimer's. "Having loss of Y is not 100 percent predictive that you will have either cancer or Alzheimer's, as there were men in the study who had the mutation and lived with no symptoms well into their 90s. But in the future, loss of Y in blood cells can become a new biomarker for disease risk and perhaps evaluation can make a difference in detecting and treating problems early." The researchers will next investigate the effect of loss of Y in larger cohorts and explore in greater detail how it confers risk for specific types of cancers and disease. They also plan to look at the cellular changes caused by loss of Y and how it affects different types of blood cells. Researchers have recently started to catalog the symbiotic microbes found in the intestines of extremely old human individuals, aiming to gain an understanding of the degree to which differences in microbial populations between individuals can influence the odds of survival in later life. The microbial environment of the gut has been shown to influence aging in various species to a great enough degree to be worthy of investigation by those scientists who seek a full understanding of how aging progresses. From a high level perspective, consider that calorie intake is one of the most influential of environmental factors when it comes to pace of aging, and the activities of microbial populations in the gut help to determine how the amount of calories consumed maps to amounts of specific molecular constituents of food passed on to the rest of the body. There are also interactions between gut microbes and the immune system that may be important, and no doubt a range of other mechanisms to consider as well. The study of the extreme limits of human lifespan may allow a better understanding of how human beings can escape, delay, or survive the most frequent age-related causes of morbidity, a peculiarity shown by long-living individuals. Longevity is a complex trait in which genetics, environment, and stochasticity concur to determine the chance to reach 100 or more years of age. Because of its impact on human metabolism and immunology, the gut microbiome has been proposed as a possible determinant of healthy aging. Indeed, the preservation of host-microbes homeostasis can counteract inflammaging, intestinal permeability, and decline in bone and cognitive health. Aiming at deepening our knowledge on the relationship between the gut microbiota and a long-living host, we provide for the first time the phylogenetic microbiota analysis of semi-supercentenarians, i.e., 105-109 years old, in comparison to adults, elderly, and centenarians, thus reconstructing the longest available human microbiota trajectory along aging. We highlighted the presence of a core microbiota of highly occurring, symbiotic bacterial taxa (mostly belonging to the dominant Ruminococcaceae, Lachnospiraceae, and Bacteroidaceae families), with a cumulative abundance decreasing along with age. Aging is characterized by an increasing abundance of subdominant species, as well as a rearrangement in their co-occurrence network. These features are maintained in longevity and extreme longevity, but peculiarities emerged, especially in semi-supercentenarians, describing changes that, even accommodating opportunistic and allochthonous bacteria, might possibly support health maintenance during aging, such as an enrichment and/or higher prevalence of health-associated groups (e.g., Akkermansia, Bifidobacterium, and Christensenellaceae). According to new research, just less than one per cent of the population is naturally protected against developing chronic coronary artery diseases. The study involved 292,000 participants of European origin. Applying advanced gene sequencing techniques, the researchers located an area - a deletion - in the human genome, which lacked twelve DNA building blocks in 0.8 per cent of the participants. Subsequent cell experiments revealed that due to the deletion, the serried gene - ASGR1 - is unable to establish the normal structure and function of the protein called the asialoglycoprotein receptor. The receptor protein binds certain sugars and surprisingly, it now turns out that the receptor plays an important role in our cholesterol metabolism and potentially related to vascular inflammation, and in whether or not we develop arteriosclerosis in coronary arteries. "What's spectacular about the discovery is the fact that individuals with this rare and particular mutation have a lower level of cholesterol in their blood and their risk of developing arteriosclerosis is 34 per cent less. In other words, just under 1 per cent of the European population is fortunate to have been born with a mutation that decreases their cholesterol levels and thus to a certain extent protects them from developing coronary atherosclerosis. The mutated protein is expressed in a part of human biology which we have not previously been focused on in our attempts to understand the mechanisms behind arteriosclerosis. This unexpected finding will undoubtedly result in many researchers examining the underlying biological systems very thoroughly; hoping to utilize this new knowledge to develop new preventive measures and treatments for cardiovascular diseases." Aging (senescence) is an increase in mortality risk with age due to deterioration of vital functions. Understanding the mechanisms and consequences of aging is not only an intriguing evolutionary question but also a matter of practical concern with pressing demographic and societal implications. The two aspects of aging research - fundamental understanding of why organisms age and how aging patterns in nature vary on the one hand, and an applied perspective dealing with biomedical treatments of aging on the other - have entered an exciting phase. I argue that the next steps to understand the biology of aging should combine approaches and concepts used by the two research communities. Biogerontologists are interested in proximate mechanisms of aging, use laboratory models and focus on means of mitigating specific functional declines associated with aging. Advances in biogerontology have demonstrated that these proximate mechanisms of aging and interventions to modify lifespan are shared among species. Evolutionary biologists seek to understand why aging has evolved and how and why it varies among populations and species. Long-standing theories to explain the evolution of aging have recently been found unsatisfactory in their ability to explain many observed patterns of aging, revealing how incomplete our understanding of the evolutionary aspects of aging (and variation in aging rates within and among species) currently is. A systematic feedback between functional and evolutionary research on aging is needed to provide mutually beneficial critical insights into the biological basis of aging. In nature, aging patterns have proven more diverse than previously assumed. The paradigm that extrinsic mortality ultimately determines evolution of aging rates has been questioned and there appears to be a mismatch between intra- and inter-specific patterns. The major challenges emerging in evolutionary ecology of aging are a lack of understanding of the complexity in functional senescence under natural conditions and unavailability of estimates of aging rates for matched populations exposed to natural and laboratory conditions. I argue that we need to reconcile laboratory and field-based approaches to better understand (1) how aging rates (baseline mortality and the rate of increase in mortality with age) vary across populations within a species, (2) how genetic and environmental variation interact to modulate individual expression of aging rates, and (3) how much intraspecific variation in lifespan is attributable to an intrinsic (i.e., nonenvironmental) component. I suggest integration of laboratory and field assays using multiple matched populations of the same species, along with measures of functional declines. The authors of this paper argue that stochastic mutational damage to nuclear DNA is important in the progression of vascular aging, the declining function and structural integrity of blood vessels. It is more or less the consensus hypothesis that nuclear DNA damage does broadly contribute to all facets of the aging process by causing a growing random dysregulation of cellular activity, and is not just a matter of cancer risk. There those who argue the opposite position, however, that while this is damage, outside of cancer risk nuclear DNA mutations don't create enough disarray over a normal human lifetime to matter in comparison to other forms of cell and tissue damage. As for most of the molecular damage of aging, there is a lot of room to argue over relative importance because there are few presently available ways to repair any one form of damage in isolation to see what happens. If all forms of damage could be so repaired, then the research community would certainly know how important each was, but that still lies in the future. Cardiovascular diseases (CVD) are the leading cause of death worldwide, responsible for killing 17.3 million persons per year. The onset of CVD is triggered by vascular endothelial alterations characterized by an impaired endothelium-dependent vasodilation, the overproduction of pro-inflammatory and prothrombotic molecules, and oxidative stress. Age is the strongest independent predictor for CVD in risk scores in middle-aged persons, and an important determinant for cardiovascular health in the population aged 65 or older. Aging is characterized by the complex interaction of cellular and molecular mechanisms that leads to a collection of functional problems. Focusing on the vasculature, such problems are closely associated with each other, and include worsened vasodilation, increased arterial stiffness and overt remodeling of the extracellular matrix, diffuse intimal thickening and a dysfunctional endothelium. The mechanisms through which age actually contributes to cardiovascular risk remain the subject of speculation. A recently proposed alternative view on vascular aging has emerged that presents new mechanistic alternatives for understanding the process of vascular aging. In this novel paradigm, causal mechanisms for the process of aging itself, most notably genomic instability, including telomere attrition, drive the detrimental changes occurring increasingly with (biological) aging. In the present review we summarize the evidence that supports the role of genomic instability in vascular aging. In addition, we present mechanisms through which genomic instability generates the functional changes that are typical for the aging vasculature. Nuclear DNA lesions, among which is telomere erosion, and mitochondrial DNA damage are strongly associated with several main features of vascular aging, such as diminished vasodilator capacity and increased vasoconstriction, increased blood pressure, increased vascular stiffness and atherosclerosis. Pivotal cellular biological changes involved in these pathological features comprise cellular senescence, apoptosis, autophagy, stem cell exhaustion and altered proliferative capacity of vascular cells. The role of gene mutation and of compromised transcription remains unknown. Potential mediating signaling pathways involved include components of the survival response, notably antioxidants under regulation of Nrf2 (beneficial), increased inflammatory status (detrimental) and decreased IGF-1/GH signaling (detrimental), as well as the interplay between mTOR, AMPK and NFκB, SIRT-1, and PAI-1, p53- and p21- and p16-related signaling. Proposed remedies against genomic instability-related vascular aging include PAI-1 inhibition, mTOR inhibition, dietary restriction, senolytics, PDE1 and PDE5 inhibitors and stimulators of Nrf2. The studies were performed under the auspices of the U.S. National Toxicology Program (NTP). Potentially preneoplastic (pre-cancer) lesions were also observed in the brain and heart of male rats exposed to RFR, with higher confidence in the association with neoplastic lesions in the heart than the brain. No biologically significant effects were observed in the brain or heart of female rats regardless of type of radiation. In 2011, the WHO/International Agency for Research on Cancer (IARC) classified RFR as possibly carcinogenic to humans, also based on increased risk for glioma. * The rodents were subjected to whole-body exposure to the two types RFR modulation currently used in U.S. wireless networks — CDMA and GSM — at frequencies of 900 MHz for rats and 1900 MHz for mice, with a total exposure time of approximately 9 hours a day over the course of the day, 7 days/week. 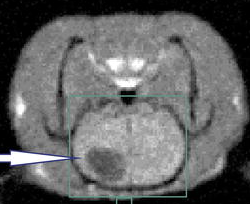 The glioma lesions occurred in 2 to 3 percent of the rats and the schwannomas occurred in 1 to 6 percent of the rats. The U.S. National Toxicology Program (NTP) has carried out extensive rodent toxicology and carcinogenesis studies of radiofrequency radiation (RFR) at frequencies and modulations used in the US telecommunications industry. This report presents partial findings from these studies. The occurrences of two tumor types in male Harlan Sprague Dawley rats exposed to RFR, malignant gliomas in the brain and schwannomas of the heart, were considered of particular interest, and are the subject of this report. The findings in this report were reviewed by expert peer reviewers selected by the NTP and National Institutes of Health (NIH). These reviews and responses to comments are included as appendices to this report, and revisions to the current document have incorporated and addressed these comments. Supplemental information in the form of 4 additional manuscripts has or will soon be submitted for publication. These manuscripts describe in detail the designs and performance of the RFR exposure system, the dosimetry of RFR exposures in rats and mice, the results to a series of pilot studies establishing the ability of the animals to thermoregulate during RFR exposures, and studies of DNA damage. Capstick M, Kuster N, Kühn S, Berdinas-Torres V, Wilson P, Ladbury J, Koepke G, McCormick D, Gauger J, Melnick R. A radio frequency radiation reverberation chamber exposure system for rodents Yijian G, Capstick M, McCormick D, Gauger J, Horn T, Wilson P, Melnick RL and Kuster N. Life time dosimetric assessment for mice and rats exposed to cell phone radiation Wyde ME, Horn TL, Capstick M, Ladbury J, Koepke G, Wilson P, Stout MD, Kuster N, Melnick R, Bucher JR, and McCormick D. Pilot studies of the National Toxicology Program’s cell phone radiofrequency radiation reverberation chamber exposure system Smith-Roe SL, Wyde ME, Stout MD, Winters J, Hobbs CA, Shepard KG, Green A, Kissling GE, Tice RR, Bucher JR, Witt KL. Evaluation of the genotoxicity of cell phone radiofrequency radiation in male and female rats and mice following subchronic exposure. Imagine if people with dementia could enhance good memories or those with post-traumatic stress disorder could wipe out bad memories. A Stony Brook University research team has now taken a step toward that goal by manipulating one of the brain’s natural mechanisms for signaling involved in emotional memory: a neurotransmitter called acetylcholine. The region of the brain most involved in emotional memory is thought to be the amygdala. Cholinergic neurons that reside in the base of the brain — the same neurons that appear to be affected early in cognitive decline — stimulate release of acetylcholine by neurons in the amygdala, which strengthens emotional memories. Because fear is a strong and emotionally charged experience, Lorna Role, PhD, Professor and Chair of the Department of Neurobiology and Behavior, and colleagues used a fear-based memory model in mice to test the underlying mechanism of memory and the specific role of acetylcholine in the amygdala. To achieve precise control, the team used optogenetics, a research method using light, to stimulate specific populations of cholinergic neurons in the amygdala during the experiments to release acetylcholine. As noted in previous studies reported on KurzweilAI, shining blue (or green) light on neurons treated with light-sensitive membrane proteins stimulates the neurons while shining yellow (or red) light inhibits (blocks) them. 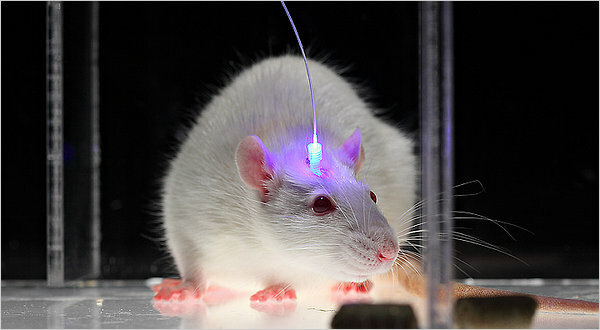 So when the researchers used optogenetics with blue light to increase the amount of acetylcholine released in the amygdala during the formation of a traumatic memory, they found it greatly strengthened fear memory, making the memory last more than twice as long as normal. But when they decreased acetylcholine signaling (using yellow light) in the amygdala from a traumatic experience — one that normally produces a fear response — they could actually extinguish (wipe out) the memory. Role said the long-term goal of their research is to find ways — potentially independent of acetylcholine (or drug administration) — to enhance or diminish the strength of good memories and diminish the bad ones. Their findings are published in the journal Neuron. The research was supported in part by the National Institutes of Health. We examined the contribution of endogenous cholinergic signaling to the acquisition and extinction of fear- related memory by optogenetic regulation of cholinergic input to the basal lateral amygdala (BLA). 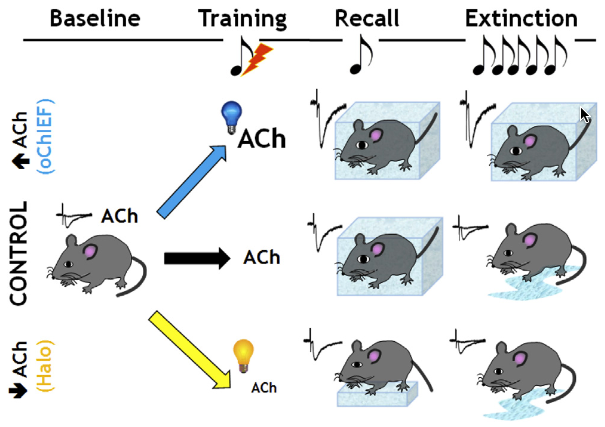 Stimulation of cholinergic terminal fields within the BLA in awake-behaving mice during training in a cued fear-conditioning paradigm slowed the extinction of learned fear as assayed by multi-day retention of extinction learning. Inhibition of cholinergic activity during training reduced the acquisition of learned fear behaviors. Circuit mechanisms underlying the behavioral effects of cholinergic signaling in the BLA were assessed by in vivo and ex vivo electrophysiological recording. Photostimulation of endogenous cholinergic input (1) enhances firing of putative BLA principal neurons through activation of acetylcholine receptors (AChRs), (2) enhances glutamatergic synaptic transmission in the BLA, and (3) induces LTP of cortical-amygdala circuits. These studies support an essential role of cholinergic modulation of BLA circuits in the inscription and retention of fear memories. We are far enough into this process of disruption that some outsiders have become scientists and some scientists have joined the insurrection. There are thousands of supporters of rejuvenation research, there is respectful and informed press attention, and tens of millions of dollars have been deployed to advancing this cause. The first rejuvenation therapies are under development in startup companies. We're almost at the stage where the people who at the beginning carried out the hard, thankless work of spreading new ideas, obtaining support, and kicking shins - telling the scientific community that they were going about everything the wrong way - start to be buried by the second wave. It is the fate of all pioneers to be forgotten and trodden upon by a collaboration between later newcomers, those with more resources to claim the mantle of leadership, and those of the former mainstream who decide to pretend that they agreed all along. Such is life. It is frustrating, but the important thing is not the credit, but that the job will be done, that repair-based therapies for aging will become the new mainstream on the basis of obtaining far better results than the present approaches to aging. Life and health before pride. I've been led here by Sonia Arrison, a Silicon Valley local and author of 100-Plus: How the Coming Age of Longevity Will Change Everything. Arrison has agreed to show me around her strange Californian world, populated with very wealthy, very smart dreamers, who share her certainty that a longevity revolution is on its way. We've arrived on Joon Yun's doorstep to learn how and why he, along with a small group of big power players, plan to "cure" aging and extend human health span - and possibly even human life - by decades, if not centuries. "I essentially made a wager to myself that aging is a code," Yun explains to me from across a shiny conference table. "If aging is a code, that code could be cracked and hacked. The current system in healthcare is a whack-a-mole of your symptoms until you die. It addresses the diseases of aging, but not curing the underlying process behind aging itself. The healthcare system is doing a good job of helping people live longer and stronger lives, but aging is still a terminal condition." In 2014, Yun created the Race Against Time Foundation and Palo Alto Prize, which will award $1 million to a team that can demonstrate the capacity to mitigate aging by, among other things, extending the life of a mammal by 50 percent. Faith that science will conquer aging is common in Silicon Valley these days. The language Yun uses to explain his dream - especially the use of the word "cure" - makes traditional researchers in the field of aging cringe. But few are complaining about the interest of the big-spending Silicon Valley crowd. In recent years, public institutions like the National Institutes of Health have been slow to commit any more than a token of their overall budgets to aging research. It is the private funders with big dreams who are galvanizing the field. The Ellison Medical Foundation has spent nearly $400 million on longevity research. Oracle founder Ellison told his biographer, "Death makes me very angry." PayPal cofounder and venture capitalist Peter Thiel helped fund the SENS Research Foundation, a longevity organization co-led by British gerontologist Aubrey de Grey, who's argued we might someday halt aging and extend life indefinitely. (Arrison, Thiel's longtime friend, introduced the two). In 2013, the founders of Google launched Calico, short for California Life Company, to research aging and associated diseases. A year later Calico teamed up with the biopharmaceutical company AbbVie, with which it plans to invest up to $1.5 billion to develop age-related therapies. "With some longer term, moonshot thinking around healthcare and biotechnology, I believe we can improve millions of lives," wrote Google cofounder Larry Page. The quest to extend longevity makes perfect sense in Silicon Valley, explains Lindy Fishburne, a longtime lieutenant of Thiel's, in her stately office in San Francisco's Presidio, a former military base that sits on a pictorial tip of the San Francisco Bay. "It's the engineering culture which says we'll build our way out of it, we'll code our way out of it, there has to be a solution. I also think it's coupled with a very unique optimism that is pervasive in Silicon Valley." Scaffolded DNA origami is a versatile means of synthesizing complex molecular architectures. 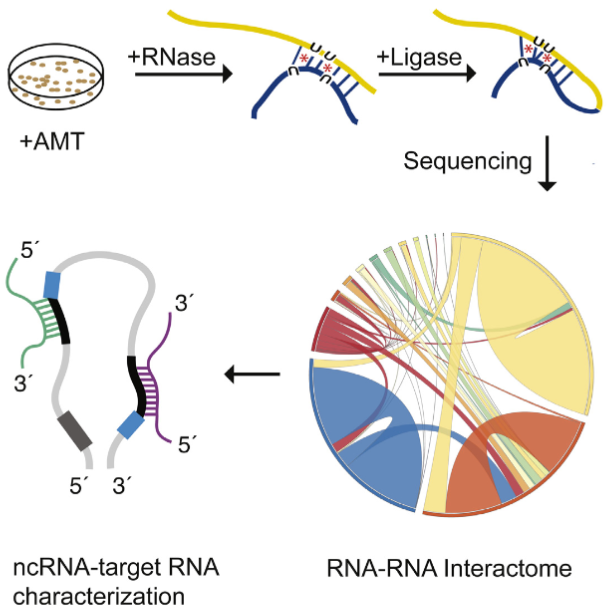 However, the approach is limited by the need to forward-design specific Watson-Crick base-pairing manually for any given target structure. Here, we report a general, top-down strategy to design nearly arbitrary DNA architectures autonomously based only on target shape. Objects are represented as closed surfaces rendered as polyhedral networks of parallel DNA duplexes, which enables complete DNA scaffold routing with a spanning tree algorithm. The asymmetric polymerase chain reaction was applied to produce stable, monodisperse assemblies with custom scaffold length and sequence that are verified structurally in 3D to be high fidelity using single-particle cryo-electron microscopy. Their long-term stability in serum and low-salt buffer confirms their utility for biological as well as nonbiological applications. Most of the more than $100 million the venture arm of the World Bank’s International Finance Corp. will invest this fiscal year will go to the emerging markets, including tech hubs such as Nairobi, Kenya — dubbed the “Silicon Savannah”. But recently the IFC has also invested in Silicon Valley companies such as the cloud-based software company Ayla, the satellite company Planet Labs and the online education company Coursera. The post Why the World Bank’s venture capital arm is investing in Silicon Valley appeared first on Singularity University. Though research is a slow moving and rigid process, one study shows that the rate of scientific study has exploded in the last 50 years. According to the paper, humanity’s scientific output now doubles every nine years. Considering the rigors of science — that’s pretty fast. And it’s just the average rate. In specific areas like healthcare, the doubling rate is even faster — as much as every 3 years currently with an expected increase to every 73 days by the early 2020s. For overwhelmed researchers navigating the growing stack of science literature — the value isn’t in having so much new information, but finding relevant insights when they need them. According to Jacobo Elosua, a co-founder of Iris AI — a Singularity University portfolio company — the research process is very often tedious and unfruitful. “Researchers are genuinely struggling to find the scientific papers, the clinical data, and other information required to do their job. And when they do find it — it’s most often after a painful and time consuming process,” he told Singularity Hub. Elosua and the team at Iris hope recent advances in machine learning AI might be one way through the noise. Machine learning is powerful because it allows programmers to assign a task to an algorithm — in this case, combing through scientific literature — and then let the code teach itself to improve its model as it is fed more data over time. Iris works by reading scientific papers and learning to determine what’s being discussed in the text. The goal is to augment the discovery process by leading researchers to relevant papers and new discoveries as they are published. By identifying emerging trends and concepts within the areas of science that may impact a researcher’s domain of interest, AIs can shoulder some of the burden of constantly scanning new literature. The promise of an accelerated research process is exciting, but hurdles remain. Though global trends in academia have shown a shift to open access, many research papers are locked away in closed databases. Also, Iris's proof of concept scans the science literature contained in TED talks, a fairly broad set of areas. Iris is currently working to develop more specialized ways to use their service. Another Singularity University start up, Miroculus, is hoping that their more targeted machine learning tool may help with their own research needs. The team at Miroculus — in partnership with Microsoft — have built Loom, a tool that uses machine learning to search papers for the relationship between specific microRNAs and various diseases and genes. Though Miroculus' core business is developing a low-cost cancer diagnostic tool, the Loom project may prove valuable to research efforts in their space. MicroRNA is a type of RNA found in the bloodstream that delivers genetic instructions telling the body what proteins to build and when to build them. In a TED Talk, Miroculus CTO Jorge Soto explains that microRNAs help regulate gene expression. And since changes in gene expression are a major component of cancer, understanding how microRNAs vary depending on conditions in the body — and measuring these changes — may help us diagnose cancer far earlier than today’s standards. In the talk, Soto describes how catching cancer early is the closest thing we have to a silver bullet cure against it. But there’s a problem. Soto says, “There is no compelling way to access much of the microRNA research today, other then to manually retrieve relevant papers and read them thoroughly.” This can take days or even weeks in some cases. Loom is able to locate relevant papers that mention specific microRNAs, extract the relevant parts of the paper, and then score the relationship between the microRNA and the specific gene or disease being studied. According to Soto, Loom was trained by learning from a manually created dataset that curated over 10,000 mentions of microRNAs, and the tool becomes more accurate every day as more literature is published. As AIs take on more responsibility in managing the discovery process, the science community may free up significant portions of the time they currently devote to scanning for trends. One Canadian AI company, Meta, can already scan for emerging technology trends and predict those technology's future significance. In parallel, as AIs learn to better navigate the subtleties of language, they may be better equipped to draw meaning from science literature. Earlier this month, for example, Google announced exciting progress in natural language understanding and open-sourced machine learning code in the area, which may further empower AI-assisted research tools. Though science is moving fast — maybe too fast for our brains to handle — projects like Iris and Loom are out to show how AI can help today’s researchers keep up with today's accelerating pace. Interested in learning more about our economic future? Join leading manufacturing experts at Singularity University and CNBC's Exponential Finance conference June 7-8, 2016 in New York. Researchers recently made an important discovery in protein science that will advance our understanding of the inner workings of cells. In an article published in Scientific Reports, the team said they found a critical evolutionary link between a protein’s structure and its function. Like tiny molecular machines, proteins handle a variety of functions from transporting chemicals to breaking food down into nutrients. 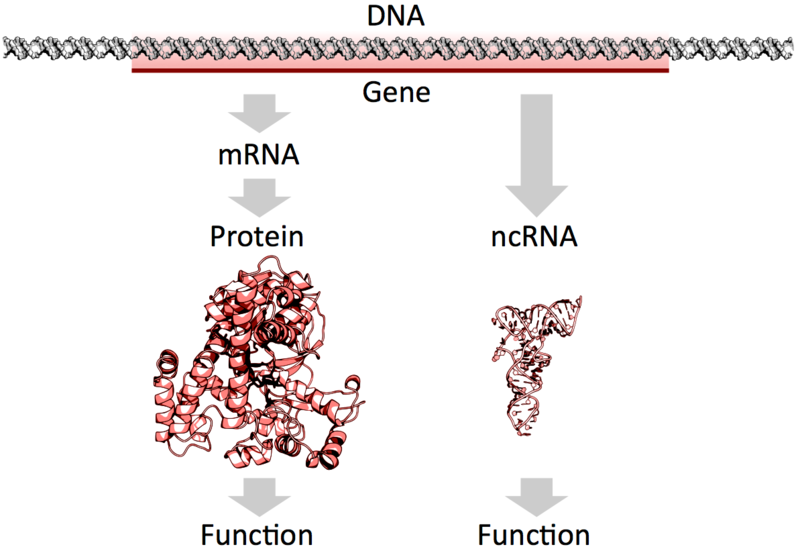 The vast range of protein function is possible because of their unique gene-encoded sequence of amino acids, which affects the three-dimensional shape that folded protein chains adopt. To better understand them, researchers have sequenced and resolved a huge number of protein structures. Currently, the Protein Data Bank includes 110,000+ structures—far more than the number with known functions. 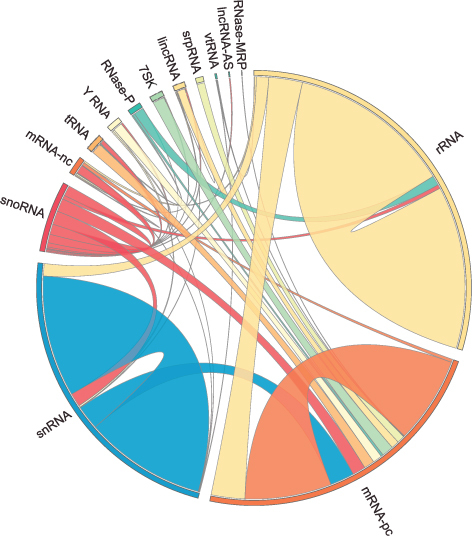 Powerful bioinformatics tools assist in making correlations between the shape and purpose of a protein, but what’s been missing is a direct structure-function link, tantamount to a Rosetta stone-like key. Fortunately, such a key has now been unearthed. Researchers in the lab of Professor Gustavo Caetano-Anollés at the University of Illinois examined specific sequences that code for small “loops” in proteins. These loops are critical components in forming active sites, which are the pockets within the protein where functions often take place. "It turns out that there are little snippets in our genes that are incredibly conserved over time," Caetano-Anollés said. "When we look at higher organisms, such as plants, fungi and animals, as well as bacteria, archaea, and viruses, the same snippets are always there. We see them over and over again." By investigating networks to probe the linkage between a protein’s unique structure and its molecular function, the researchers discovered that loops have been utilized in active site formation throughout the geological record. These loops are the first step in being able to understand the function of proteins in cells from billions of years ago to today. "The big problem in biology is the question of how a protein does what it does. We think the answer rests in protein evolution," Caetano-Anollés said. "For the first time, we have traced evolution onto a biological network." 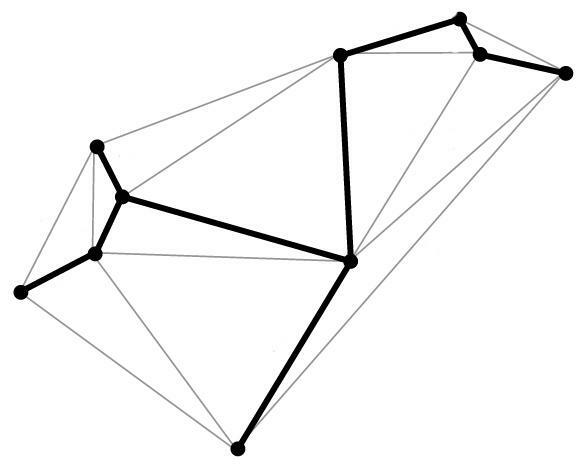 It appears the loops are conserved through an emergent property referred to as hierarchical modularity, which is “the building of small cohesive parts into larger and increasingly complex wholes," according to Caetano-Anollés. Hierarchical modularity occurs because in large networks complex organizations of components arise. These organization are referred to as cohesive modules, and they’ve been observed in nonbiological systems as well, including manmade networks like the internet. Now that the researchers’ methods have identified loops as cohesive modules, the approach can be used to search for other patterns retained across the timeline of protein evolution. While this research clearly has value to unraveling protein structure-function relationships in ancient and modern organisms, that loops are so key to active site formation will be of particular interest to synthetic biologists interested in the design of new proteins. In fact, the more cohesive modules identified, the easier it will be to create entirely new sets of proteins with desired functionalities, opening the door to true designer proteins. Researchers have developed a new method for doping (integrating elements to change a semiconductor’s properties) single crystals of diamond with boron at relatively low temperatures, without degradation. Zhengqiang (Jack) Ma, a University of Wisconsin-Madison electrical and computer engineering professor, and his colleagues describe a solution in the Journal of Applied Physics, from AIP Publishing. They discovered that if you bond a single-crystal diamond with a piece of silicon doped with boron, and heat it to 800 degrees Celsius (low compared to conventional techniques), the boron atoms will migrate from the silicon to the diamond. It turns out that the boron-doped silicon has defects such as vacancies, where an atom is missing in the lattice structure. Carbon atoms from the diamond will fill those vacancies, leaving empty spots for boron atoms. The new method currently only works for P-type doping, where the semiconductor is doped with an element that provides positive charge carriers (in this case, the absence of electrons, called holes). The researchers are already working on a simple device using P-type single-crystal diamond semiconductors. But to make electronic devices like transistors, you need N-type doping, which gives the semiconductor negative charge carriers (electrons). And other barriers remain: diamond is expensive and single crystals are very small. Still, Ma says, achieving P-type doping is an important step, and might inspire others to find solutions for the remaining challenges. Eventually, he said, single-crystal diamond could be useful everywhere — perfect, for instance, for controlling power in the electrical grid. * Currently, you can dope diamond by coating the crystal with boron and heating it to 1450 degrees Celsius. But it’s difficult to remove the boron coating at the end. This method only works on diamonds consisting of multiple crystals stuck together. Because such polydiamonds have irregularities between the crystals, single crystals would be superior semiconductors. You can dope single crystals by injecting boron atoms while growing the crystals artificially. The problem is the process requires powerful microwaves that can degrade the quality of the crystal. With the best overall electronic and thermal properties, single crystal diamond (SCD) is the extreme wide bandgap material that is expected to revolutionize power electronics and radio-frequency electronics in the future. However, turning SCD into useful semiconductors requires overcoming doping challenges, as conventional substitutional doping techniques, such as thermal diffusion and ion implantation, are not easily applicable to SCD. Here we report a simple and easily accessible doping strategy demonstrating that electrically activated, substitutional doping in SCD without inducing graphitization transition or lattice damage can be readily realized with thermal diffusion at relatively low temperatures by using heavily dopedSi nanomembranes as a unique dopant carrying medium. Atomistic simulations elucidate a vacancyexchange boron doping mechanism that occurs at the bonded interface between Si and diamond. We further demonstrate selectively doped high voltage diodes and half-wave rectifier circuits using such dopedSCD. 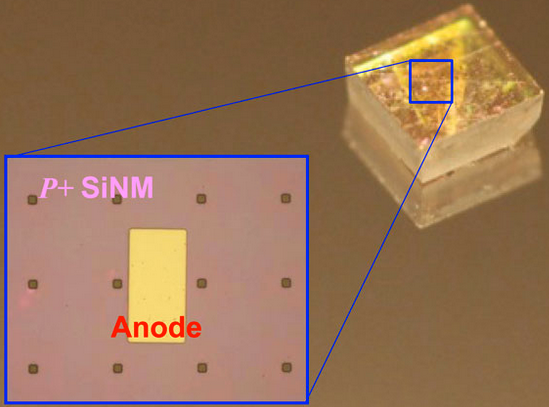 Our new doping strategy has established a reachable path toward using SCDs for future high voltage power conversion systems and for other novel diamond based electronic devices. The novel dopingmechanism may find its critical use in other wide bandgap semiconductors. In this post, I am going to give an overview of the Hyperloop and explain how you could bring this transportation system to your city through the Hyperloop Challenge. Born out of frustration with California's plan for a bullet train between Los Angeles and San Francisco—the slowest and most expensive per mile bullet train around, with an estimated cost of $70 billion—the vision for the Hyperloop is a high-speed transportation system that could take travelers from San Francisco to L.A. in 35 minutes for a fraction of the cost. In other words, it's a "vacuum tube transportation network" that will be able to travel at around 760 mph (1200 kilometers per hour) — on land and underwater. The team is led by Brogan BamBrogan, who did the design work on the second-stage engine of SpaceX's Falcon 1 and was lead architect for the heat shield of the Dragon capsule. They just closed their latest round of funding of $80 million and achieved a major technology milestone last week. Hyperloop One’s new CEO Rob Lloyd (past Global President of Cisco) notes that passing this hurdle means they are well on their way to having a full-scale hyperloop to test by the end of the year — on a projected 2-mile track reaching full speeds of over 700 mph. Hyperloop's Kitty Hawk Moment — End of This Year!